Welcome to Miss Diversity, Miss Teen Diversity, Mrs. Diversity and Miss Diversity News, Miss Teen Diversity News & Mrs. Diversity News Pageants Buy Souvenir Program Book page! CLICK ON IMAGE TO BUY PROGRAM BOOK. 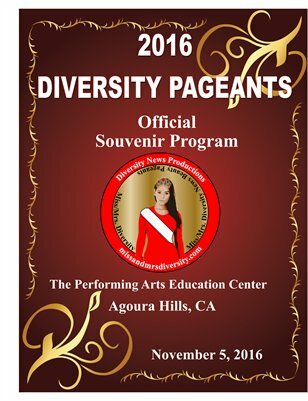 1st annual Miss/Mrs Diversity & Miss/Mrs Diversity News Pageants 2016 Official Souvenir Program Book published by Diversity News Publications for Diversity News Productions.